Learn how to make fun and pretty homemade makeup with simple ingredients. 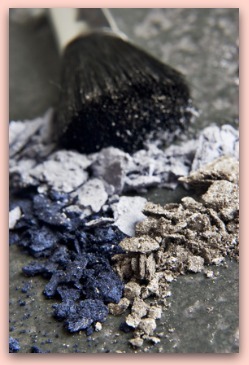 Making makeup will save you a lot of money and will allow you to create the perfect shades for you! 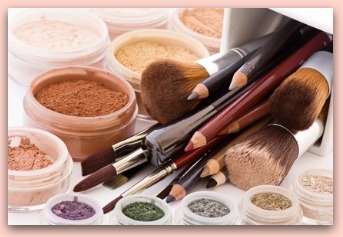 For some product types, professional high end makeup can truly make all the difference. Foundation especially is one product you won’t want to skimp on. However, there are many other makeup items you can make at home by mixing basic drugstore ingredients to create comparable products. This tutorial will show you how to make a homemade eye primer, cheek and lip stain, tinted lip balm, and a makeup brush cleaner at very little cost. These are a few items you won’t need to buy from high end Sephora companies with steep price tags. One thing to remember if you begin making some of your own makeup is to always save your old jars and bottles from other store-bought makeup items. These can be washed and reused many times with soap and rubbing alcohol. If you run out, you can usually find a replacement container at a craft or party supply store. Eye makeup primer is one of those necessary makeup items that can cost between $20 and $30 for some of the higher end brands. It is great for keeping your eyeshadow in place all day long, but you might prefer saving that money for something more noticeable. To create your eye primer, mix a dab of petroleum jelly with a bit of moisturizer and fill your jar. Voila! Tinted lip balm is another easy-to-make cosmetics. Have you ever wandered the makeup aisles and wanted to buy five or six shades of lip gloss, but couldn’t afford to have them all? This recipe will make having a collection of homemade makeup lip balm shades for everyday cheap and fun. Mix one teaspoon petroleum jelly and one teaspoon moisturizer into a uniform cream. Then, add some Kool Aid or Jello powder, or loose pigments and shimmers, to the mixture and stir well. Continue adding your favorite colors and shimmers until you get the prettiest shade. Cheek and lip stains are exceptionally easy to make at home, and are great for days when you want to make sure your makeup won’t rub off. Simply begin mixing pure beet juice into your favorite moisturizer until you reach a color that will fit your skin tone. You can also add a shimmery powder to give your skin a dewy glow. Lastly, one item you can really save money on is commercial brush cleaner. Baby shampoo is actually one of the best cleansers you can use on your brushes, and is something that makeup artists use regularly. It is gentle and rinses easily, which protects the soft bristles.